Candidates should understand the importance of a balance sheet to the stakeholders when assessing the performance of the business. Candidates should be able to identify the various components of a balance sheet. Candidates should be able to make judgements on the performance of a business through interpretation of the information contained in simplified versions of the balance sheet and by the application of current and acid test ratios. Candidates will be given the relevant formulae for ratios, where appropriate, as part of the examination paper. > Why should the two figures balance? Your balance sheet is a financial statement at a given point in time. It provides a snapshot summary of what your business owns - assets - and what it owes - liabilities - at a particular date. 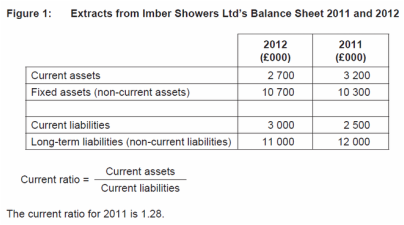 The balance sheet therefore shows how your business is being funded and how you are using these funds. This is often used by investors, when decididing if to invest in a business i.e. is it under valued and you expect it to grow and be worth more in the future. Something the business owns that'll last longer than 12 months. Long term loans that'll take longer than a year to payback. Based on Tesco's accounts. How would different stakeholders be effected? What is important about how DFS sells its sofas? What problems could this lead to and why? How do firms generate cash? Why might this be hard to do quickly with sofas? What might DFS need to do if they need cash urgently? 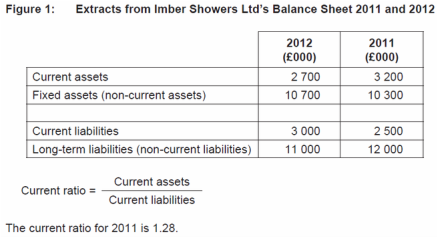 Imber Showers Ltd ’s current ratio has changed between 2011 and 2012. Describe how this change might affect Imber Showers Ltd. Explain in words what this means. Explain what this mean for the business. Explain why it is good or bad. Explain What might this mean they have to do.